I started this Mangathon, and then I got sick. Boo. Sickness. Now I am sitting here, sniffly, sore, and trying to catch up on life. Day two is a curveball of a prompt. My FAVORITE manga? Oh, man. Do I pick the manga I read most often? The manga that has most stirred my inner soul (if such a thing exists)? I'm picking Loveless. A manga I don't read, except on occasion, because it just destroys me every time. I am a sucker for words. I devote a lot of my life to language and Loveless is about language in a way. The teams in the world of Loveless are paired by shared names. They defeat their enemies with language. They speak (spell, really) things into being. Beautiful. Ts' its' tsi' nako, Thought-Woman, is sitting in her room and what ever she thinks about appears. She thought of her sisters, Nau' ts' ity' i and I' tcs' i, and together they created the Universe, this world, and the four worlds below. Thought-Woman, the spider, named things and as she named them they appeared. She is sitting in her room thinking of a story now I'm telling you the story she is thinking. (Ceremony, Leslie Marmon Silko). Stories are creation. People create whole worlds with language, whole impossible universes. They tell stories of the living and the dead, of what is and was and what may be. It's all language. Even in our everyday lives, we forget the ways we call things into being by casting spells...spelling...duh. It's no mistake that the same word spell/spell means to form words, and to create some magical force out of language. Words are magic, they are power and creation. And names are the most powerful words. They leave their mark on us. What we are called lets us know where we are, who we are with, our relationship and really...who we are. 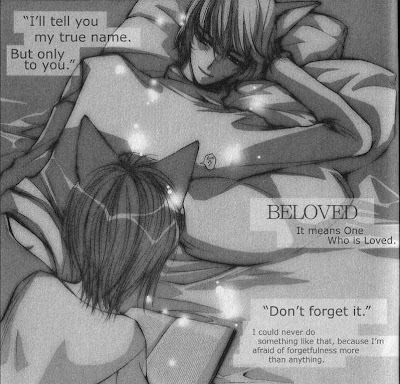 So what's that have to do with Loveless. Well, everything. It's a story about a lost little boy, abused, forgotten. It's a story about an artist who doesn't have a will of his own. They are left behind when the person they love most dies. They find each other. They sacrifice for one another. They seek redemption. It's a beautiful story. And in the English print version there are some amazing essays about the power of language. I just wish someone would re-license the series, so I could read the end.